For the classic man, the Southcape Southcape Geometric Knit Jumper is a must-have for the coming Winter season. Crafted from cotton and polyester, this chunky knit sweater has ribbed edges and an easy care quality, making it perfect for every day wear throughout the cooler months. 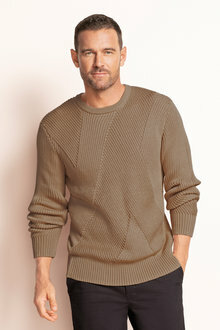 A classic casual style, this jumper stand out when worn with jeans and a collared shirt for a put together dressy casual look.